Little House Home Arts: Address Books Should be Kept in Pencil! While cleaning out my basement, I found an old loose leafed address book, with another whole set of refill pages. I remembered the call I had just made to a friend of mine to again ask for a common friend's most recent phone number only to discover that I already had it, but was confused between all the different numbers in my old address book. I confessed to my friend that I already had that number but that my address book was too messy to be clear, she simply commented, “I finally learned to do my address book in pencil”. How stupid that after all these years, I still was trying to keep an address book in ink! Then I chuckled to myself, as I remembered all the care that I have taken in setting up my address books. If you were my friend, you were permanently added to my address book. You would not only remain my friend for life, but you were supposed to be "permanently located" as well and not move more than once, as my extra spaces for names and addresses were limited in my address book! Yes, I am a control freak, and by writing in permanent ink, I thought I could keep people from moving, and even from dying?! I was young then and had a whole life ahead of me and I figured that everyone else did as well! 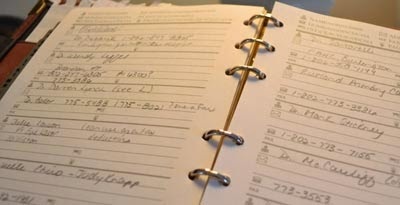 My address book had also become filled with the awful details of those dreaded phone calls telling of serious life-threatening and urgent health issues,hospital numbers, numbers of relatives to call, and next to their birth days, the dates of their death and their address scratched out when they departed to heaven! My address book became a biographical historical journal as well! My notes were not how I wanted to remember my family and friends, though for some time, I couldn’t bear to let these details go along with my loved ones. As I recopied my address book, I realized that many names can simply be deleted. I now know that not every acquaintance becomes a friend-for-life.Taking care of my mother in her last years, as well as the demands of my own illness limited the time I had to spend with friends. Relationships require time and love to keep and our lives have a way of taking their own courses. I am learning that this need not be cause for regret. All of life is a journey and sometimes the best we can do is flow with it versus trying to hang on to what isn't any longer. I now content myself with a clean and well ordered address book with all names, addresses and phone numbers written in pencil, ready to be altered as needed. I keep the numbers for public service, the local plumber, sewer service, library and my church, along with those of my friends, though fewer in number. I am figuring that this address book should be a nice quick reference for the next twenty years or so. My old address book will be stored in the history section of my basement for when I get around to updating the family tree started by my father years ago. I am more mature now and know that nothing is permanent, not even friends or family. We are all temporary at best. I will work to keep in touch with my friends, as I can, but will also be accepting of those that take their leave. I will hopefully make new friends to add to my book, though the number isn't critical! Living and enjoying the present is really the best that any of us can do and it is nice to have the updated numbers of my friends, easy to find.